With a stay at Hôtel Rania Belmadina in Casablanca, you'll be within a 10-minute drive of Place Mohammed V and Casablanca Twin Center. Featured amenities include complimentary newspapers in the lobby, dry cleaning/laundry services, and a 24-hour front desk. Free self parking is available onsite. A stay at Riad Belko places you in the heart of Marrakech, walking distance from Saadian Tombs and Moulay Al Yazid Mosque. 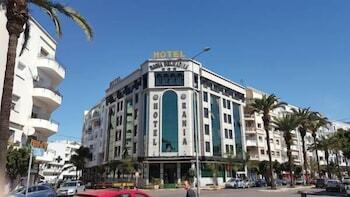 When you stay at Relax Hôtel Kénitra in Kenitra, you'll be 6 minutes by car from Universite Ibn Tofaill. Free self parking is available onsite. With a stay at La petite kasbah in Zagora, you'll be within a 5-minute drive of La Grande Mosque Amzrou and Prefecture of Zagora. Free self parking is available onsite. With a stay at Camp Adounia in Mhamid, you'll be within a 10-minute walk of Mhamid Main Square and Mosque Mhamid. Free self parking is available onsite.